Gigi's Thimble: Quilty Fun Sew Along, Blog Tour & Giveaways! 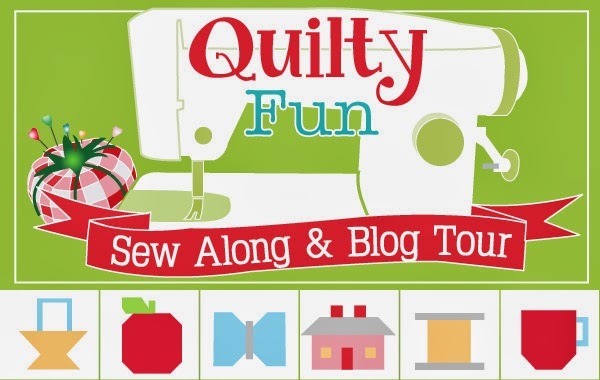 Quilty Fun Sew Along, Blog Tour & Giveaways! Are you ready for some more Quilty Fun??? It's week 15 of Lori Holt's Quilty Fun Sew Along and Blog Tour and I hope you've been sewing along with us! It's finally my stop on the blog tour and I'm so excited to share with you my sweet little butterflies! First, I've gotta say though, that I'm a big fan of Lori's and was super excited that she asked me to be a part of all the fun. 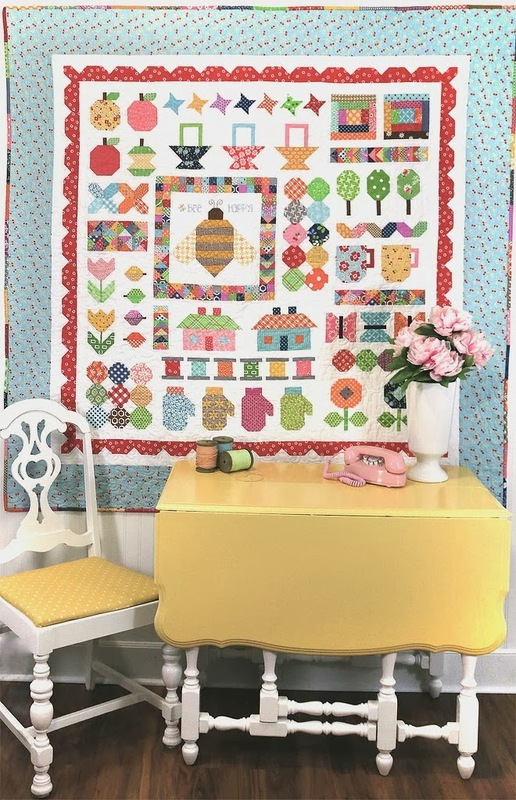 So excited in fact that I had already pre-ordered my copy of her book, Quilty Fun and made one of the featured projects (my Apple-licious quilt which you can check out HERE). Quilty Fun is chock-full of inspiring photos, clever piecing instructions and darling projects. It's definitely a winner! For the Sew Along, Lori has designed a sampler quilt based off of some of the blocks in her Quilty Fun book. To join the Sew Along, you'll need a copy of her book, Quilty Fun (which can be ordered HERE through the Fat Quarter Shop). You'll also want to head to the Blog Tour landing page for the links to all the different blog stops. Each week you'll use instructions from Quilty Fun along with a companion pdf sheet to complete your Sew Along blocks. And wouldn't you know ~ the companion sheets are just as cute as her book! So gather up your favorite fabrics and let's get started!!! I've been using lots of bright fabrics from my stash and decided these Lecien florals would be perfect for my sweet little butterflies. Once you get your fabrics cut, these little butterflies will work up in no time! If you're sewing along and want to win some fabulous prizes, be sure to upload pictures of your butterfly blocks to the Quilty Fun Sew Along Flickr Page. I'm a little envious because two lucky winners will win a 10" rotating Busyfingers cutting mat and one lucky winner will win a set of Alphabitties! I really want one of those cutting mats (round, and pink and just so cute!!!) Winners will be announced next Monday, March 3rd on the Jolly Jabber blog. Oh, and as a special bonus, I'm giving away one copy of Quilty Fun to one of YOU! It's not too late to join the fun! Just leave a comment below and I'll announce a winner next Monday too! Maybe you could tell me what Quilty Fun project or block is your favorite! How nice of you to share! I followed Lori's row along forever ago but never got around to making one for myself. It's still on my bucket list, though. I would LOVE a copy of the book! I think the apples are my favorite. How fun! I would love to win this book and give it to my friend that I quilt with! My favorite project in the book is the tulip quilt. I plan on starting one soon to give to my mom as a mother's day gift. Tulips are her favorite! Wow so fun. I would love to join along. Thanks for the chance to win. This looks like so much fun! The fabrics you chose make it so cheery! Thanks for offering this book as a give away. I love the apples best! Your Quilty Fun project is darling, and I think all the agonizing over fabric selection was worth it. It's absolutely perfect! I'm also doing this fun quilt along & am having so much fun. I look forward to each weeks block. I've never done anything like this before & am proud of myself for keeping up. Looking forward to putting it all together. I just LOVE Lori Holt! I love Lori Holt's beautiful work. I would really like to make her sewing machine cover from the book - it's so cute! I have been watching this sew along from the sidelines and would love to join in! I love butterflies, so my favorite block would be the butterfly block. Oh, I would love the book! You are so sweet!!! I've been wanting to do this quilt along but have been putting my spare money towards the kids and not toward quilting. Thank you so much for the chance to win!! Oh, I'm a huge Lori fan and would just love to win this book. Thanks so much for the chance!! I love her work and have her book on my wish list. My favorite is the tulips. Thank you, would love a chance to win Quilty Fun! I think the houses may be my favourite. How fabulous, I would so love to have this book! The butterflies are so cute! It's looking amazing! I love the apples, especially having just an apple core in the middle of the row. Oh, I do love your apple quilt. Would love to make one just the same. I like the apple core and little stars blocks! I love all the blocks, but the houses were really fun to make. This quilt is so stinking cute! I really like the little "X"'s. Thanks for the giveaway. My favorite block/quilt has to be the apple block and applicious quilt. LOVE! Especially the apple core. So creative! Thanks for the chance to win! Hi. I'm new to the quilting world and am Loving it! This quilty fun book looks great! Thanks!!! It's so hard to pick a favourite as they are all so cute. If I had to pick just one it would be the butterflies. I like the butterflies and the baskets. Such a fun and happy quilt. Well, I love all of Quilty Fun, but the apples are particularly adorable ;-) Thanks for the chance to win. It is hard to pick a favorite block from the book but I will pick the apple block. I'm such a huge fan I can't choose one thing. I need the book to try everything, thanks for the chance. I think the houses are too cute. Your Quilty Fun quilt is looking great! My favorite blocks are the apples and the tulips. The butterfly blocks are my favorite and I especially like how you used that border print on one of yours. Clever! Cups, tulips, houses, fruit, butterflies - oh, I love them all! I just love the entire quilt! I have been following along on your quilt along with great envy. All the blocks are so adorable! The book just wasn't in the budget this quarter. So sad. :( Keep up the great work! I'm loving everything about this quilt. Thanks for a chance to win! The butterflies caught my eye - and they are just lovely! I'm a fan of Lori's, too. I like all the blocks in the sampler, but I think the house blocks is my favorite. I like the coco mug block, too as I can imagine a lap quilt of colorful mug blocks. Thank you for a chance to win of copy of Lori's book. I hope I win. I recently saw a circa 1910 Basket Quilt that I fell in love with. I'd love to recreate it with the Quilty Fun Basket Blocks. They're all cute, but I love the butterfly blocks! I love them all! I do especially like the tulips and cups! I'm a big Lori fan, too. I am also a fan of Lori! I did the Row Along Quilt with her, and I recognise most of the blocks from that one. I would love to win a copy of the book! I love the apple block the most! I love Lori's book and would love to win one. My favourite block is the apple's, they're so cute. I just love those quilty cups! I'm thinking of making a whole scrappy quilt out of them. With Lori's creativity, how can anyone pick just one? I love everything she does! Im a fan of yours and Lori's. I just love the Butterflies. Thank you for the giveaway, I would love to own this book. Thanks so much for a chance to win! I made the original row along quilt, but never got the book so I could make this one too. I've loved watching everyone else's come together. This is a wonderful project - really difficult to pick a favorite block, but the flower in the bottom right corner is at the top of the list. Would be thrilled to win a copy of the book for my quilter's guild library, of course I would be the first to check it out! Thanks so much for the opportunity and for sharing your talents. I love the House blocks. You really have an eye for fabrics. Your choice for the butterflies is perfect. Thanks for offering the generous giveaway. What a great giveaway! I've been eyeing this book ever since it came out. Such cute blocks! Thanks for the chance to win. My favorite quilty fun block is the butterfly! Yours are so cute in the floral fabric. Picking the fabrics takes me the longest in anything I make! The butterflies are so cute--thanks for the chance to win!! I am new to quilting and this would be the prefect first project. I did not know about the Sew Along. Hope I win the book! I've a weakness for the baskets...or the houses...or the apples...or...Let's face it! Lori is fantastic! My favorites are the houses and the trees! I love the apples best! They're adorable! Just amazing .. I think a butterfly quilt in a granddaughter's future !! My favorite block is the coffee cups -- but they are all cute! I love the tulips. If I won this book, I would give it to my BFF in Idaho and we could do our own little blog along. I love the apples!!! They are the cutest! I'd love to catch a glimpse of Lori's brain- where does she get all the ideas from?! Thanks for sharing and showing us your beautiful blocks!!! I love anything Lori! I love her house, her designs, her fabrics....her house! LOL I am still playing catchup on the quilt along...and am really enjoying all of the blocks. Do I have a favorite??? ?Hmmm....I love the cups! Love this quilt! My favourite block is the apple! I love the coffee mug block and would love to play along!!! Thank you ... would love to have a copy of her book. I, too, like just about every block, and every fabric Lori uses. However, I think my favorite 2 blocks are the apples and the houses. Thanks for a chance to win this great book! I love Lori's designs but haven't started this quilt along yet. I love her butterflies. Hi Amber, Your sampler is gorgeous! The time you spent picking out the colors was well worth it. My favorite blocks are your sweet houses with the cute people in the doorway. Hi Amber, Your sampler is gorgeous. The time you spent picking out your fabrics was well worth it. My favorite blocks are your sweet houses with the cute people in the doorway. Do you have to be a blogger to be a winner? I love to quilt, but haven't made any of Lori's projects yet. If I had this book, I sure would make one of the fabulous designs. Wow, WOW are all I can say! Wow! I follow Lori on her blog and always enjoy her tutorials, like Bonnie Hunter and Jenny Doane I've learned so much from them. Your butterflies are so cute, thank you for hosting this weeks block. I think my favourites are the bee block and the hexi's. I just love the bee - can't wait to see it blogged. Your butterflies just sing out "spring"! Winning Lori's book would be so cool. I have not been able to find it locally, and haven't gotten around to ordering it. Thanks for the opportunity. I"ve just fallen in love with Lori's patterns! I just finished Mix it Up! It is sooo cute! I absolutely love your applelicious quilt! I think the apple blocks have to be my favorite! I can't wait to get this book! Oh and your butterfly with the polka dot and floral fabric is adorable with the way you cut it out! Your Quilt's looking fab Amber! I adore the patterns in this book, and would be so pleased if I were lucky enough to win it. This quilt is amazing! Can't decide if the cups or the tulips are my favorite, I just love the all over look! Your butterflies are very cute. I want to make the apple quilt or the butterfly one. I just love those apples! The apple blocks are my favorites, Just love them. What darling patterns! I LOVE the butterflies. I love them all, but the houses are my fav! If I had to choose one block, the cup would be my favorite. Thanks for the giveaway! Too many cute and happy blocks to pick just one - but that apple block's are yummy to the eye. Seeing how cute this sampler is by following all the weekly posts has made me want to make one. I would love to win the book to do so. Thanks. I love the cups and think they would look so cute on a tote bag!! Sooo Sweet!! My favourite block is the apple block! Oh a friend is working on a sampler from this now and I love it! I think my favorite is the house block. So cute. My favorite is the Navy Butterfly Quilt in Lori's book or the sewing machine cover that's simply adorable. I would love to win a copy of the book. Thanks for the opportunity!